You DO ride with ear plugs, right? If not, you've got no excuse; wearing ear plugs can prevent wind-induced hearing loss, will reduce rider fatigue and, contrary to what many believe, will allow you to hear MORE of your engine and surroundings (e.g. automobiles). I literally haven't ridden a mile without ear plugs since the first time I tried them around 1998. The key is finding plugs that work for you among the many brands, shapes and materials on the market; most fall into the categories of foam, wax/silicone, plastic or custom molded. 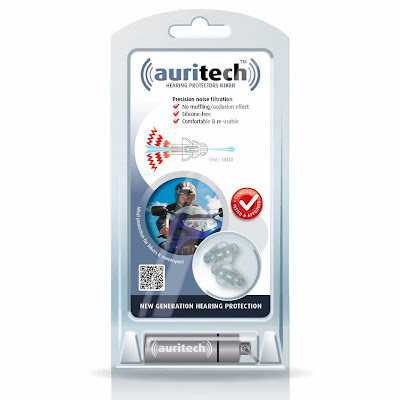 I've been auditioning a set of Auritech Hearing Protectors/"Biker Earplugs" from Appia Healthcare, a UK outfit with extensive hearing protection experience. They're available from retailer AllEarPlugs.com, which also sells a great variety of ear care and hearing protection products. The Auritechs are constructed of soft thermoplastic and contain both a ceramic filter and a venturi chamber, which together are claimed to attenuate wind noise without muffling conversational frequencies. We've had a lot of snow and ice so far this winter, so my riding has been limited, but after about 400 miles I can say that the Auritech Biker plugs perform as claimed. While the claimed attenuation is a little over 29db, I don't notice much difference in noise reduction between the Auritechs and my "go-to" foam plugs that are rated at 33db. Comfort is highly individual, with ear canal size and shape, and helmet interior construction all playing a part, but these plugs worked fine for me without a hint of pressure or pain. The Auritech plugs are much easier and quicker to insert than my foamies -- using the molded-in "handle" one simply inserts them straight into the ear canal while pulling the ear up and back a bit; no rolling/compressing required like with foam plugs. Unlike foamies, however, the Biker Earplugs won't be thrown away after a few uses, so some minimal care is required; AllEarPlugs sells a cleaning kit, or they can be washed in soapy water. 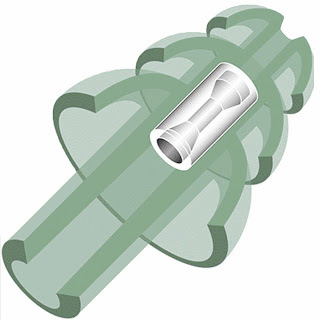 The plugs are supplied with a useful aluminum screw-top cylindrical carrier sealed with a rubber o-ring, which also has a split-ring for attaching to a key ring, jacket zipper pull, tank bag zipper, etc.